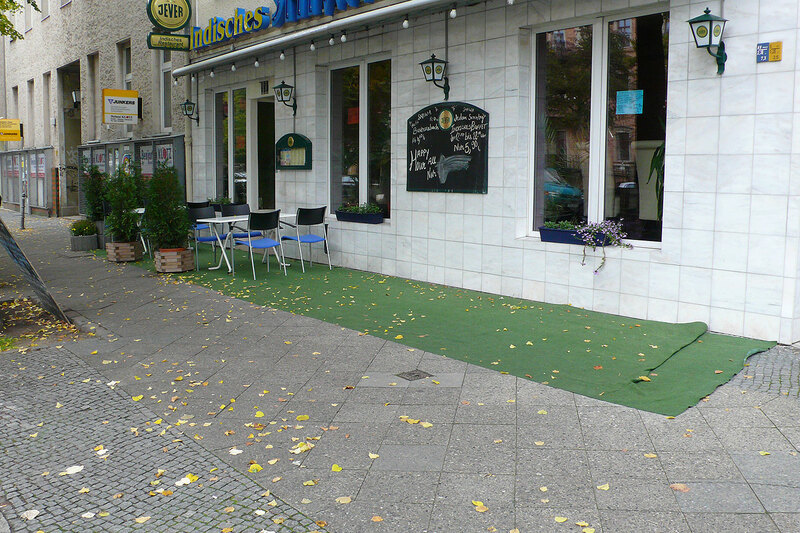 The budget end of the gastronomic industry is deeply invested in AstroTurf: as a cheap, low-res simulation of nature – suggestive, too, of upholstered domestic comfort – but also as a territorial device demarcating the jurisdictional extent of highly localised municipal zoning policy. Accordingly, these throw-rug-landscapes are the precise, diagrammatic expression of regulatory protocols. Astroturf Gemütlichkeit is a phenomenological catalogue. #010 — Where’s the Hopsack? Pre-historic sea-life, fake grass and organic coffee, finally united, in the Swan Shopping Center, Dublin. The narcissism of small differences, on Skånegatan, Stockholm. Serious crumple, half-way up Lindenstraße, Berlin. A small platform at ice-cream point-of-sale on Zossener Straße, Berlin. A shisha bar somewhere near Ostbahnhof, Berlin. Nostalgic vibes on Lietzenburger Straße, Berlin. A small grassy island on Leipziger Straße, Berlin. Precision and ruin on Nostitzstraße, Berlin. Horror and neglect on Michaelkirchplatz, Berlin. Nature beckons at U-Bahnhof Botanischer Garten, Berlin.